Teacher Staci Weaver of the Austin Middle School in Douglasville, Georgia demonstrates how she has put the ACE Archaeological Simulation program to great and innovative use in her class for Self-Contained Students with Autism. In part one she illustrates each step of the preparation and set up of the simulation. The smiles on her students faces indicate what a great success her implementation of the Arch Sim program is! Read Part 1 (.pdf 3.8mb) The document will open in new window. Kerin Steigerwalt of Springhouse Middle School, Allentown PA developed the ACE Coin Journal. It makes use of ACE coins in a very innovative and interdisciplinary manner. It is worth checking out! Thanks Kerin! Jeff Baum of Mexico Middle school in Mexico, NY, has shared some really neat ideas with us.... please do try them out. Dawn LaFon, a truly talented teacher at White Station High School in Memphis, TN, is a recipient of many local, as well as ACE, awards - recently Dawn, Dr Tom Buggey of Memphis U., and Dawn's class were featured on local TV. Since the early days of ACE, Dawn LaFon has been pioneering the use of ancient coins, and here we give you her latest ideas for Internet use. Sandy Gilmore teaches in Danville, PA, and is a super teacher and ACE veteran, look at her idea on "Coin Rubbings"
After just six months of teacher Lisa Auanger of Hampton, VA, starting the ACE program with her students, we knew she was a "rising star" and awarded her the "Best New Teacher of the Year" prize. Very quickly she shared her teaching gifts and ancient coin knowledge with the Weekend and Summer programs at the illustrious College of William & Mary in Williamsburg, VA...... we are oh so happy and lucky to have her as part of the ACE Teachers Group! Jerry Scoppa is a great teacher - from a teaching family and those of you who are active in Latin circles, will know his mother, Susie Scoppa. Jerry is a tremendous history buff and is always ready to share his ideas and knowledge. He and Susie have taught at an American Numismatic Association Seminar in Florida - what greater recommendation could one have! Dr Lane Brunner of the American Numismatic Association has generously shared this document with us. He is a charming person, and if you have not been been to the ANA in Colorado Springs, you have missed something. 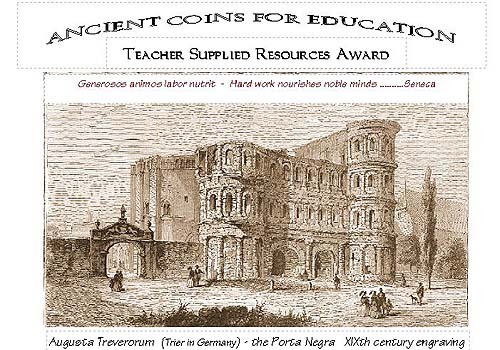 Each Summer they run a wonderful Seminar called "Coins in the Classroom" there and ACE's own Cathy Scaife teaches the Ancient Coins section - as an ACE Teacher you are eligible for a Scholarship to attend this unique experience........ what more could you want!